With the latest transfer rumours pointing towards Chelsea potentially selling Alvaro Morata to Atletico Madrid, it’s little surprise to see Blues fans talk up a new potential signing. That man is their former star Diego Costa, who has struggled since leaving Stamford Bridge for the Spanish capital last season. Costa was a big hit in his time at Chelsea, with Morata proving a poor quality replacement in the end after a dire spell in English football. 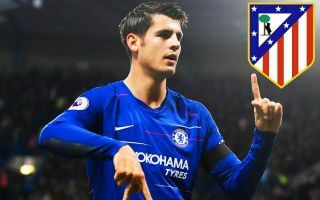 With Sky Sports now reporting Morata could be the next Blues attacker to make his way to Atletico, a number of the club’s fans are calling for the return of Costa. It remains to be seen if this is at all realistic for Chelsea, but it would certainly be a popular choice if they could do it. Atletico wants Morata? A swap deal with Costa is needed. Looks like Morata is off to Atletico, can we have our Costa back ? If Athetico want Morata, Chelsea should try to bring back Costa ????? Atletico want morata? Swap deal for costa surely ?